How is a club meeting run? As a guest you do not need to bring anything with you, nor is there a need for prior knowledge and your attendance is .free of charge.. We love to answer all your questions referring to the Duesseldorf Toastmasters. Usually several guests attend each Toastmaster evening, i.e. you will not be “alone”. You can also attend several club evenings as a guest to gain a deeper insight into our club life. Please register so that we can plan ahead. Every Toastmaster evening is being presided over by an experienced member, who will coordinate its course as “toastmaster of the evening”. Impromptu speeches, prepared speeches and subsequent feedback are the key elements of the Toastmaster concept as it is used worldwide by almost all Toastmaster clubs according to the same rules. During each evening between ca. 30 and 40 members and several guests will attend. So you are in good company. The first programme topic are the Impromptu speeches. 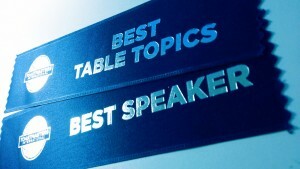 Each impromptu speech will last 1-2 minutes and will be given about a topic announced on the spot. As a guest and if you like to you are welcome to participate. Afterwards up to five prepared speeches, usually between 5-7 minutes long, will follow. Each speaker works on a speech project with a specific focus, e.g. structuring a speech or the use of body language. After a break the third programme block follows: Now it is the turn of the evaluators. It is the task of the evaluators to give each speaker who has delivered a prepared or an impromptu speech a constructive feedback. I.e. strong aspects of the speech will be named and suggestions for improvement added, so that the speaker can better judge her/his impact on the audience and further develop her-/himself. The provision of feedback in the format of an evaluation speech is the key aspect of the Toastmaster programme! All roles will be performed by members and it is common that every appearance on stage is followed by a round of applause by the audience. The atmosphere is very constructive and friendly which is further supported by the fact that all toastmasters refer to each other on a first-name basis. At the end of the evening and after a vote by members and guests the best impromptu and prepared speeches as well as the best evaluator will receive a small award as well as warm round of applause. You as a guest may be asked how you have liked the evening. Around 9:30 pm the official part of the evening ends. Afterwards we conclude the evening with an informal get together in the restaurant VaPiano in Golzheim: Vapiano Restaurant, Kaiserswerther Straße 229, 40474 Düsseldorf. Of course guests are welcome here as well. Here you can find a video provided by Toastmasters International which shows the typical procedure and elements of a club meeting. Despite small differences between clubs the basic meeting structure is the same all over the world. E.g. we are usually seated in rows instead of sitting around a table thereby providing a small stage in our room.